We have had some much enjoyed cooler mornings and I've seen some of us (my hand is up) shivering in the shadows but we know it won't last, so enjoy it while you can. Our next event takes into consideration the time of year and is an afternoon event and there is no need to get wet! Bonus. 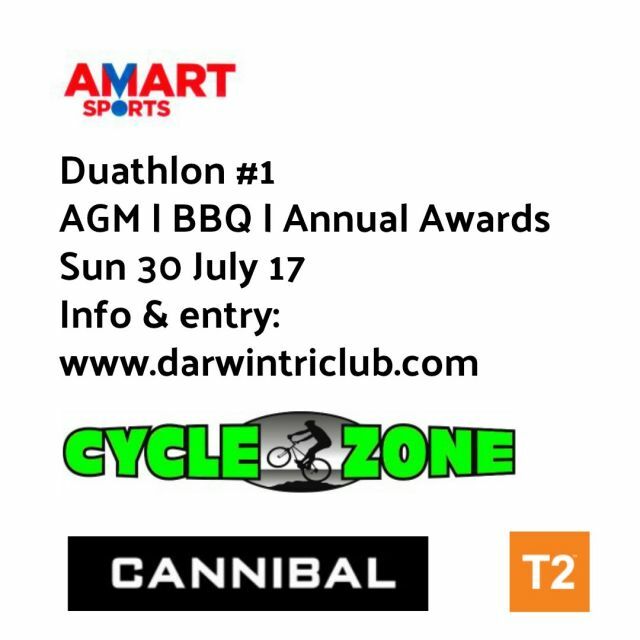 The Duathlon Series kicks off this Sunday afternoon, followed by our usually quick AGM, a relaxed BBQ and we also have our annual awards presentation (with our refined speed version) happening as well as some lucky draws. Hope to see you all there. RSVP for BBQ (whether competing or not) is required. Please complete RSVP HERE asap to assist our volunteers organising catering. 1. Parking is limited within the Reserve and the road way in, is part of the bike course, so please be mindful of that when parking. 4. This is a great opportunity to kick back after the event, relax and socialise as well as celebrate the achievements of our members during 2016 | 2017. 5. 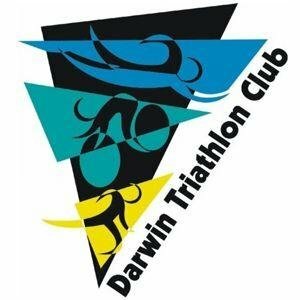 If you haven't yet renewed your membership and aren't competing on the day, you are still very welcome to attend the function afterwards. Please complete the RSVP HERE. Team categories also available to those longer events highlighted above. Lucky draws to take place after event. Please share event details with your friends. On Facebook? You can share our TRIFEST Event Page. 2. If you are a current member and unable to attend our AGM, we ask that you complete the proxy form to be circulated later this week. Watch your inbox for that. 3. Great to receive our first TRIFEST entries. 4. We are looking for someone to head up our TRIFEST team and act as RD on the day. Sounds like you? Please get in touch via email. 5. We apologise to those who have had difficulty renewing their memberships manually and we hope those with queries are now sorted. It may help to read the FAQs is you are still to renew. 6. Please note, if you had your membership set to auto-renew but have changed credit cards in the last 12 months, your membership may be still outstanding. You should have received emails if this has happened. 7. FYI Junior memberships do not auto-renew. 1. Congratulations Lucy Thompson and Dale Berk on your recent marriage. 2. Farewells continue. Gayle Viney and Alan Barrett are on the move and we'll be sorry to see them go. Both have been awesome volunteers during their time at the club and will be missed. 3. Tom Ryan is also among those who have headed down south. 4. Our Treasurer Lisa Payne is also another on the move shortly. Lisa has been an amazing volunteer and as well as keeping our finances up to date, RD'd no less than five events on the last calendar. Thanks Lisa for your valued contribution to our club. 5. It's not a one way street out though, we have welcomed back Chris Monahan recently. 6. Good news! We now have a new supply of ladies cotton club tees in sizes 12 & 14. Also stock in size 6, 8 & 10. These & the men's sizes (inc XL not shown below) are available at $15 or 3 for $40. 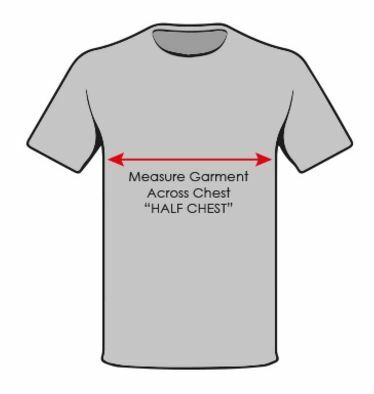 Kids Sizes are $10. 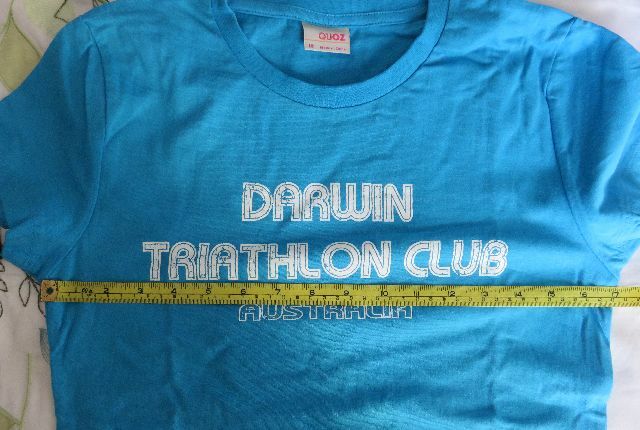 If you would like to pay for and pick up at the Duathlon on Sunday, please email your half chest size and I'll let you know colour availabilty. Stocks in some sizes are limited. First in best dressed.